The Foodie Monster! 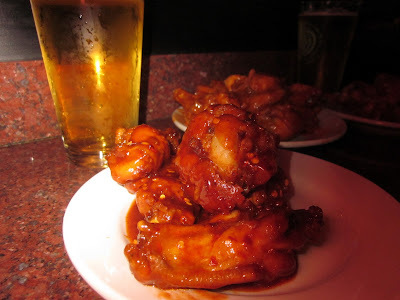 : Croxley's Ales in the East Village for Great Beers and the Cheapest Wings in NYC! Croxley's Ales in the East Village for Great Beers and the Cheapest Wings in NYC! I have a weakness for hot wings and my go-to spot is Croxley's in the East Village right on Ave B and East 2nd. They don't have the best wings but they are decent, and come in at an amazing 10 cents per wing on Mondays, Tuesdays, and Wednesdays all night. Yup, that's right...all night! I have come here on several occasions before a show in the Lower East Side area and is a cheap and quick place to grab a bite and drink before a show. They are 20 cents on Saturdays during the day and all day Sunday, which is still a great deal. They also have a great Friday happy hour deal for FREE (doesn't get better than that!) wings from 5 to 7pm at the bar...all you need to get is a $5 drink minimum....basically you can get a drink after a week of work and fill up on wings for $5. Croxley's also has a good beer selection and even has their own beer. I usually opt for the Croxley's blonde, which is light and crisp, and is only $5 a pint. You can check their entire beer menu HERE. They even have beer cocktails but I haven't had a chance to try theirs yet.